Stretch marks are visible lines on the skin surface, with an off-color hue. Stretch marks are mainly found in the abdominal wall, but can also occur over the thighs, upper arms, buttocks and breasts. Sometimes stretch marks can cover large areas of the body. As skin is stretched, the collagen is weakened and its normal production cycle is interrupted and damaged. This ultimately results in fine scars under the top layer of the skin. Initially the marks look pink or red, but over time a thin, silvery line appears on the skin surface and a stretch mark is born. Stretch marks appear on the skin surface when someone grows quickly, or puts on weight quickly. Stretch marks can make you feel self-conscious and uncomfortable about your appearance. Aloe Vera is very effective in the treatment of many skin problems. Its healing and soothing properties can be used to get rid of stretch marks. There are a different ways in which you can apply it. 2.Make a mixture with one-fourth cup of aloe Vera gel, oil from 10 vitamin E capsules and oil from five vitamin A capsules. Rub this mixture onto the skin until fully absorbed. Repeat this process daily. The use of lemon juice is naturally acidic which helps heal and reduce stretch marks, acne, and other scars. 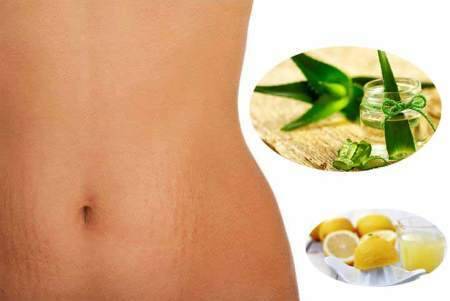 1.Rub fresh lemon juice gently onto the stretch marks using circular motions. Allow the lemon juice to soak into your skin for at least 10 minutes before rinsing it off with warm water. 2.Another way is to mix equal quantities of cucumber juice and lemon juice and apply the mixture on the stretch marks. 1.Dice a medium-sized potato into thick slices. 2.Take one of the potato pieces and rub it gently on the stretch marks for a few minutes. Make sure the starch from the potato covers the affected area. 3.Allow the potato juice to dry for some time and then wash it off with lukewarm water. Castor oil is used in the treatment of a number of skin problem, can also be used to get rid of stretch marks. 1.Apply some castor oil to the stretch marks and gently massage the area in circular motions for 5 to 10 minutes. 2.Wrap the area with a thin, cotton cloth. Using a hot water bottle or a heating pad, apply some heat to the affected area for at least a half an hour. 3.Repeat this process daily for a minimum of one month to notice positive results. Eggs are a rich source of protein. The egg whites contain amino acids and proteins. This can be effective for stretch marks. 1.Whisk the whites of two eggs gently with a fork. Clean the affected skin area with water and then apply a thick layer of egg whites with a makeup brush. 2.Allow the egg whites to dry completely and then rinse the area with cold water. 3.Finally apply some olive oil on the skin to keep it moisturized. 4.Repeat the process daily for at least two weeks and watch for positive results.